Rising geopolitical tensions in Iran, as well as the US-China trade war, are making banks more conservative when it comes to lending decisions. The sanctioning of Chinese telecoms giant ZTE Corporation, which almost brought the firm to its knees, has sent a chill through compliance officers in international banks, while the Trump administration’s abandonment of the Iran nuclear deal has added another layer of confusion around who banks can lend to. At a press conference in Hong Kong, Baker McKenzie compliance and investigations partner Mini vandePol said that borrowers are confused by the muddied waters. Often, “a lot of corporate clients only find out they have breached sanctions when their banks inform them”, she told gathered media. vandePol said that companies in certain sectors and geographies are “struggling to find lines of credit from their banks” due to the uncertainty – which is having more of an impact on bank lending than the trade tensions themselves, the effects of which are yet to be materially felt. Banks, meanwhile, are becoming more restricted in where they can lend money, for fear of being sanctioned by the Office of Foreign Assets Control (OFAC), the US government body which has doled out billions of dollars in fines to banks in recent years. This uncertainty adds to already existent anxiety over anti-money laundering (AML) legislation and know your customer (KYC) requirements, which have seen many international banks abandon business in countries and industries that are perceived as being risky. An example of this has been the widespread severance of correspondent banking relationships. Between 2009 and 2016, there was a 25% decline in such collaboration, with only China bucking the trend (Chinese banks, conversely, grew their correspondent banking relationships by 3,355% over the same period). 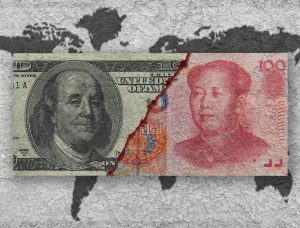 Lishi Fong, of counsel at Norton Rose Fulbright in Singapore and a commodity lawyer by trade, tells GTR that the trade war may serve to extend this conservative attitude. “Banks have been relatively conservative the last couple of years and the trade tensions may result in this conservative attitude being prolonged. But I don’t think it will exacerbate the situation significantly given that the banks and traders we work with are doing deals with the big commodity players with a strong credit risk,” she says. For smaller players in the market, it may mean longer credit approvals, with some deals already falling away due to banks’ conservatism. Despite the swirling headwinds, however, demand for trade finance in Asia remains high. Anecdotally, bankers are seeing an uptick in their lending books this year, but remain wary of the impact any sudden escalation may have. Also speaking at the event was Rob Koepp, director for the Economist Corporate Network in Beijing, who was at pains to impress the fact that this is not yet a trade war – despite the pace of the escalation. Only US$34bn of US tariffs on China have yet been activated, with China reciprocating in kind. However, should Donald Trump follow through with his various threats of imposing tariffs on US$200bn, US$400bn, US$500bn or all of China’s exports to the US, people should begin to worry, Koepp said. “We’ve seen a very quick escalation. China doesn’t really have any more to take from the US, in tariff terms. China is in a spot, but we may see more qualitative actions as opposed to quantitative measures,” he added. Part of this would be China making life more difficult for US companies working within its borders. Customs measures could be tightened, deliveries and orders delayed and production disrupted. In the middle of this salvo lies Hong Kong. More than 50% of its exports go to Mainland China, with the US in second place in terms of export destinations. Should there be a full-scale escalation, trade hubs such as Hong Kong and Singapore could stand to lose most, given that the mammoth economies of China and the US have the robustness to absorb all but the most extreme measures. The post Trade tensions making banks in Asia “more conservative” appeared first on Global Trade Review (GTR).